Please do get in touch with facts, DScans, additional streams and anything else you think is of relevance. Our Discord can be found here. In a long-running action in the early hours of yesterday morning, an Imperium fleet reinforced the shield of the NCdot staging Keepstar in the system of X47L-Q, Pure Blind. Unlike previously destroyed Keepstars in Aeschee and Kinakka, this structure is in constant and strategic use. Its destruction would be a substantial blow to northern efforts against the Imperium in the Pure Blind/Fade theatre. The armour timer comes out at 18:52 EVE tonight. It is understood that both the Imperium and Northern Bloc forces are forming hard for the affair. Legacy might also be speculatively involved via wormhole, though that has yet to be confirmed. 1809 EVE: There are approximately ~2000 Northern Bloc forces on the keepstar in X47, mostly in carriers and Megathron battleships. Imperium has mustered a number of fleets, totaling around 2800 players. Both sides are dealing with random D/Cs en masse. 1811 EVE: DScan of X47 at this time. 1834 EVE: X47 local has spiked up by 500 players. 1835 EVE: Imperium has moved in subcapitals just now. 1841 EVE: TiDi is at 60%, according to Jebi’s stream. 1842 EVE: Imperium Megathrons are warping in on the Keepstar grid. 1844 EVE: Reports coming in of Federation Uprising Jackdaw fleet on the way to help Imperium. 1846 EVE: Imperium armour titans on grid. NCdot titans undocking. 1853 EVE: Northern titans are now jumping into X47. 1855 EVE: DScan of the system as of 1852 EVE. 1856 EVE: TiDi at 30% as of 1855 EVE. 1857 EVE: As of 1857, Northern Bloc has a substantial number of FAXes on grid. 1901 EVE: Northern Bloc titans are firing doomsdays at an Imperium Erebus titan. 1904 EVE: Northern Bloc titans have fired a volley of doomsdays – two Imperium Erebuses understood to be destroyed. 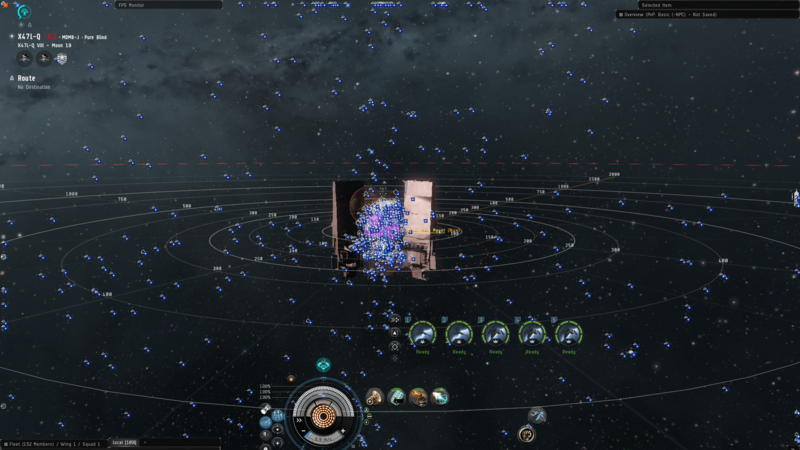 1905 EVE: Imperium is now cynoing in their shield titan fleet – numbers look at 120 titans. 1908 EVE: Third Imperium titan has been destroyed. 1911 EVE: Fourth Imperium titan has been destroyed. 1913 EVE: Fifth Imperium titan has been destroyed. 1917 EVE: At least one Northern titan has been destroyed – details to come from zKillboard. 1919 EVE: Imperium is bringing in supercapital reinforcements, according to Jebi’s stream. 1920 EVE: NER has been told that another Northern titan has been destroyed. According to INN, the Imperium has double the titan numbers on field as the north. 1921 EVE: Pandemic Horde and others frigates are moving in to close range with the Imperium titans. 1923 EVE: DARKNESS. Vanquisher down. 1929 EVE: 6th Imperium titan down. 1930 EVE: 6 Imperium titans down, 3 Northern titans down – of which 1 was a Vanquisher. 1933 EVE: Both Jebi and INN streams disconnected at this time. 1936 EVE: All titans in system at 1930. 1937 EVE: Imperium reported to be dropping more titans. Supercarriers are deploying fighters. 1937 EVE: A fourth Northern titan, belonging to CO2, has been destroyed. 1939 EVE: Accusations are coming in of intentional attempts to crash or lag the server. 1949 EVE: Combat is continuing, though it seems a stalemate. A substantial number of Northern FAXes remain in DO6, ready to jump in if need be. 1953 EVE: Legacy is confirmed to have a subcapital fleet enroute to the system. 1955 EVE: 317 Imperium titans vs 252 Northern titans on grid, following another wave of Imperium reinforcements as of 1952 EVE. 2000 EVE: Keepstar armour is at ~80%, according to NER sources on the ground. As of 1952 EVE, it was at 78%. 2001 EVE: General DScan of grid as of 1947 EVE. 2006 EVE: A seventh Imperium titan was destroyed at 1947 EVE. 2009 EVE: An eighth Imperium titan was destroyed at 1951 EVE. 2012 EVE: Killah Bee noted as calling for Northern Bloc faction titans to de-aggress and dock up, denying Imperium an easy ISK victory. 2016 EVE: A 5th Northern Bloc titan was destroyed at 2000 EVE. 2021 EVE: A 9th Imperium titan was destroyed at 1957 EVE. 2024 EVE: A compilation of zKill verified titan deaths as of 2022 EVE, by u/Hydrium. 2027 EVE: Keepstar armour at ~60% at this time, remains paused at 13 minutes 46 seconds. 2031 EVE: NCdot believed to be deploying fighters from their supercarriers. High confidence that another Imperium titan is down, awaiting zKill confirmation. 2033 EVE: Imperium believed to be bringing in their own supercarriers, going by Jebi. 2038 EVE: INN reports 11 Imperium titans down vs 6 Northern titans down. Latest Imperium titan loss. 2043 EVE: A 12th(?) Imperium titan was down at 2026. Imperium is apparently moving in another wave of titans. 2046 EVE: Imperium supercarriers are apparently at 0 on the Northern supercapital blob. 2048 EVE: In the meantime, both sides have lost a titan. Thanks to /u/Hydrium! We’re now looking at 13-7, by the looks of it. 2057 EVE: An eighth Northern titan has been destroyed. 2106 EVE: Unverified reports of Jay Amazingness being tackled at a safe in an Erebus. 2116 EVE: It appears that Legacy subcapitals are now on the field, led by Progodlegend. 2118 EVE: Jay Amazingness confirms that he has been tackled in a safe. 2126 EVE: INN says that the KS armour is at 50%. An Imperium Vendetta, piloted by Jack Tygra, is down. 2132 EVE: Two Imperium titans believed to have been destroyed, one with ZKill link here. One Northern titan has also been destroyed. This brings the total to 14- 8 confirmed, 15-8 alleged. 2138 EVE: Keepstar armour at 47%. 2139 EVE: Writer is taking 10 minute break, keep the tips coming, will write them up when back. 21:52 EVE: Keepstar at 42% armour. 21:55 EVE: 16th Imperium titan down. 21:57 EVE: DScan of the grid at this time. 22:11 EVE: A Northern titan was destroyed at 2147 EVE, bringing the total of Northern titan losses to 10. 22:14 EVE: Keepstar armour percentage at 37%. 22:15 EVE: An Imperium titan was destroyed at 22:10, bringing the total to 18. 22:18 EVE: Keepstar armour percentage at 35%, according to INN. 22:21 EVE: A Northern titan was destroyed at 22:12, bringing the total to 11 Northern titans lost. 22:26 EVE: As of 22:24, KS was at 33% armour. 22:47 EVE: KS is at 26% armour. 23:00 EVE: DScan of grid at 2259 EVE. 23:03 EVE: Sort Dragon, leader of Dead Coalition (Northern Bloc), has been primaried by the Imperium. 23:07 EVE: Keepstar is at ~15% armour as of 2306 EVE. 23:09 EVE: Sort Dragon’s titan dead, bringing total dead northern titans to 12. 23:40 /r/live mods are bad. 00:00 23 Threads deleted. Keepstar still in low armor. Both sides trading titans at roughly an even rate currently. 00:25 Doomsday Volleys still being exchanged. Killmails expected. 00:37 Zkill is dead and the EVE Server is going with it. It looks like a couple more Goonswarm titans and another Northern Titan went down. Current count at the top of the thread will remain static until KMs come through to ensure accurate reporting. 00:52 Titans still getting destroyed for both sides. Count updated. 01:02 Molok down – first one in EVE. Killmail to follow. Killmails are still trickling through so in the meantime I’m trying to do some numbers on the Dreads/FAXs/Carriers. Titans are still dying and are getting added to the killcount as they appear on zkill – though with some delay. 02:00 Titan killmails coming through after a delay. The last two titan killmails tell a small story about the volley trade rate. I can’t load the capital loss pages so currently no hard data on the number of FAX’s lost which could be a factor in what the supercarriers get up to later in the fight. 02:06 Another NC. Erebus dead. Titan difference gap is closing for now. 02:33 GSF Nyx dead – first supercarrier kill in system for a while.